Wow! Three new 30′s this week! Judith and I slipped away for a few days this week and as always the bigger Carp on Cherry Lake put in an appearance when I am away! 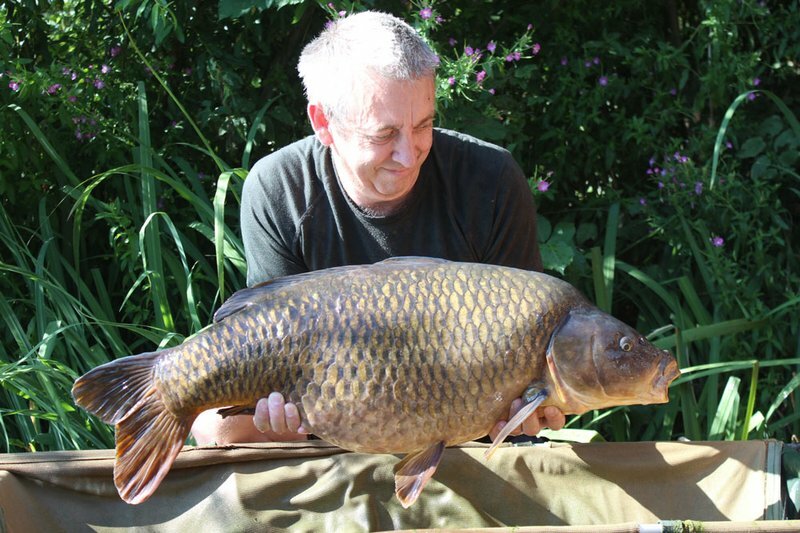 The good news is that fishery manager Dave Bowen was on hand to both weigh the Carp and photograph them. In short we had three new 30′s out this week, one each to three different anglers resulting in two new members of the 30+ club. Paul Mitchell had been staying in Cherry Lake Cottage and was on his second visit to Cherry Lakes. Last year he joined the 30+ club when he landed a 31-04 mirror to set a new PB. This year he landed another thirty to equal his PB, another Mirror of 31-04. Having compared the photos it was both a different Carp to his Mirror of last year as well as the 16th different 30lb+ Carp of the year from Cherry Lake. 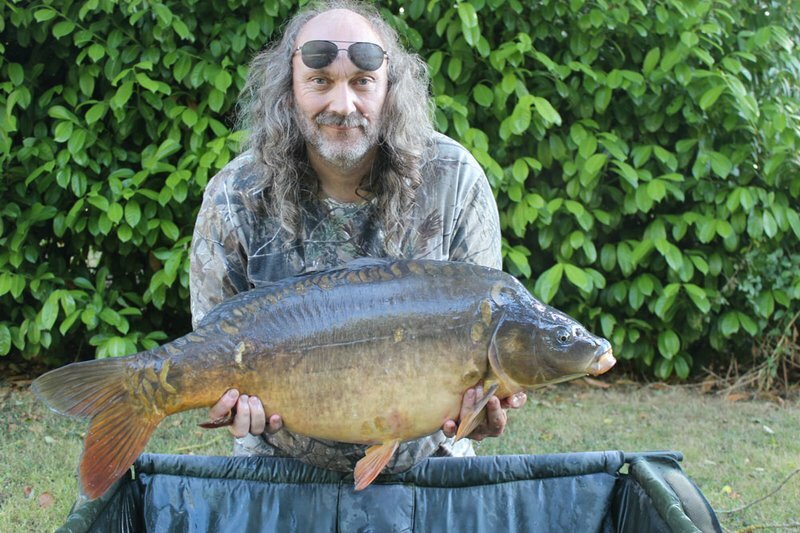 Paul caught a further 6 Carp, all 20′s between 24-08 to 27-00 including a Ghost Mirror of 26-09. Paul was delighted with his holiday at Cherry Lakes and he is already planning his return next year. Mike Jarvis and his wife Helen stayed in Grebe Lodge over the last week and enjoyed his first visit to Cherry Lake. He landed 7 Carp including two PB’s. The first a 26-08 Ghost Mirror, which was followed several days later by his new PB, a Common of 30-08. Mike used the Cherry Lakes Fish Supreme boilies. Fishery manager Dave was very excited when he called me about this Common as it is another new 30 for Cherry Lake and the 17th different 30+ caught in 2018. In doing so Mike Jarvis became the 102nd member of the Cherry Lake 30+ club. Craig Salvin is the 103rd member of the club. Craig was also on his first visit to Cherry Lake and stayed in Heron Lodge. Together with his Dad Andrew, they shared an impressive 13 Carp between them over their four day stay. 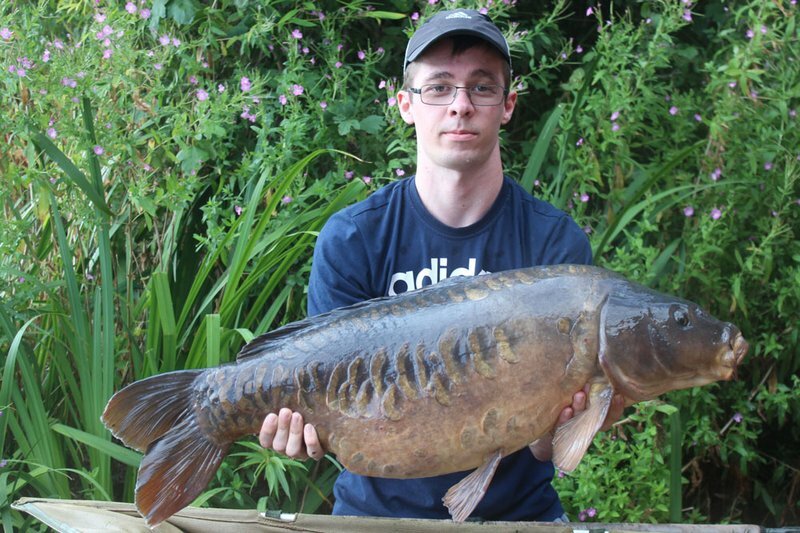 The biggest was Craig’s heavily scaled Mirror of 30-04. As this was another Carp breaking the 30+ barrier we were almost as excited by Craig to see this one on the bank. The Cherry Lake Carp are clearly feeding well judging by the good level of recent captures and the level of feed which we are putting into the Lake. It is good to see that after such a vigorous spawning season that they are now putting on weight again. My best guess is that we have around 25 Carp over 30lb in Cherry Lake at the moment, which is around 10% of the total stock. Jacob Gale also had a good stay on Cherry Springs. He has sent me a lot of good photos and I will use these in my next update. Paul Mitchell equaled his Cherry Lake PB with this 31-04 Mirror from the Cherry Lake Cottage swim.